You can quit, and they won't care, but you'll always know. Right here, right now... Fatboy Slim boomed out across the water. 2,000 heads bobbed in the early morning sunlight, ready to get started. After months of training we are right here, right now. The canon fires and the water erupts into a foam of arms and legs. I'm right there in the middle of it; Tarzan swimming, kicking, punching, breathing and surviving. 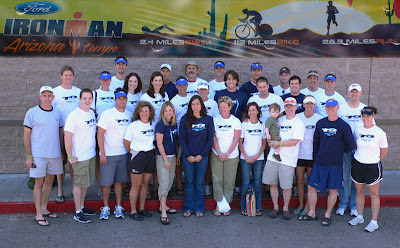 Ironman Arizona 2007 has started. It is going to be a long day. The swim pretty quickly settled down. I'd heard all the stories of black eyes, goggles getting ripped off and kicks to the head but it didn't feel any worse than a typical age group wave start. The first few hundred meters were a crazy mess of bodies but then it calmed down for me and I settled into a comfortably easy rhythm. No reason to push it yet so I just warmed up slowly. Stroke. Roll. Breathe. Stroke. Roll. Breathe. My hip flexor had been starting to tweak over the last few days of taper and I could feel it when I kicked too hard - not a good sign so early on - but I just got on with it. The turn-around seemed a long way past the far bridge but soon enough I was coming back towards the Mill Avenue bridge and I'd finished the swim. I was pretty happy to have swam 1hr 12min for 2.4 miles - right around where I thought I'd be. The wet suit strippers did their magic and I was off to transition, running through the throng of cheering supporters. I call out my number and someone hands me my bag. Quickly I find myself inside the frantic mess of the transition tent. I work my way to a quieter corner and find a chair to sit on, start going through my bag. Sunscreen, bike shorts, top, sunglasses, shoes and helmet on and I'm ready to go back out to the sunlight and noise. I step out of the tent and get more sunscreen applied and then run in my bike shoes to get my bike. Someone yells my number through a loud hailer and a volunteer gets my bike for me. This is a full service event! We have it easy - all we have to do is swim, bike & run for a while - someone else is always dealing with the logistics. 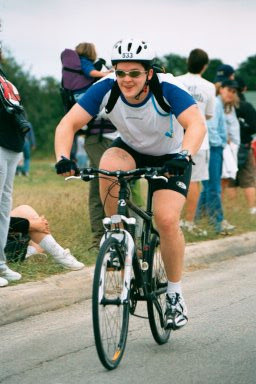 I jump on my bike and ride out to the course. I hear Amy Ewert cheering for me right as I leave on the bike - so many people out here that I know, such great support. Out on the bike course I settle in for the long haul. I'm expecting to take a bit over 6 hours but I want to start out easy and not push too hard. The temptation is certainly there. The bad thing about being a faster than average swimmer is that most of the fast bikers are behind you and spend the whole ride passing you. But that's just a case of keeping the ego in check and racing your own race. So people pass me and I spin along at 100 rpms, feeling okay, starting to eat, drinking a bit and feeling great. I get to the turn around point and I'm still feeling like I'm flying easily. Then I turn around and find out why. For some reason I never notice a strong breeze when it is helping me - but you sure notice it when it is right in your face! 20 mph sustained winds with gusts up to 35 mph had really helped me on the first half, but not on the way back! I just struggled along with everyone else, finishing the first loop and still feeling great. I'd trained for this, a bit of wind wasn't too much of a worry. At one point a helicopter appeared over a mesa, from out of nowhere. One minute I'm in a quiet desert, then there's the roar of the chopper. Flying low, following the leaders, it was just another indication that this wasn't just another triathlon - this was the big one and I was right in the middle of it. About 3 hours into the ride I realised that I hadn't needed to pee at any point. My stomach was feeling bloated which for some reason I'd taken as meaning I was drinking too much - but the problem was exactly the opposite - I was getting way behind on my hydration. Luckily I realised that, along with how much slower I was suddenly going and I really started drinking a whole lot more. Nuun, electrolytes, 2 bottles of water every 10 miles. But the damage had been done by that point. I was getting slower and slower but feeling like I was trying harder and harder. Not much I could do about it but keep drinking. and drinking. and drinking. Soon I was stopping at every water stop to pee, but still drinking and trying to get back on top of things. The end of the second loop was windier again, dust clouds were starting to obscure the course and the tumbleweeds were on the march. I saw a few blow across the course, 4 feet wide and moving fast. Some poor guy blocked one for me and got knocked off his bike for his trouble. Somehow I made it back through town and headed on my third bike loop. This time around it was getting really windy. Close to the start of the loop, 5 metal signs with sandbags slid across the course towards me, then crashed down a few feet away. Another gust pushed me sideways across an entire lane, before I could even react. Things were starting to get interesting! I rode with the wind at my back for the next 15 miles, letting it push me along, still trying to get on top of my hydration as the day got hotter. Just after the turn around I passed my friend Laurie Curry and said 'Can you believe it, we are doing an Ironman!' she grinned back at me and rode on. It was great to see people I'd trained with doing so well - all through the bike I saw training partners plugging away, moving through the field. We'd cheer for each other and it really helped keep the focus and motivation going on a tough day. The ride back to transition didn't seem too bad, even though at one point I was struggling to go at 14 mph - downhill. But eventually I made it back, through the cheering crowds, off the bike at the dismount line without falling and my bike was whisked away. One hundred and twelve miles done, 6 hours and 53 minutes later I hobbled through transition (nothing so grand as running this time) and grabbed my next bag. I saw Chris Sellers helping out at the transition tent and he took charge and got me organised. Getting the gear out of my bag, setting me up to get running. Once again out of the tent and off to the run course - just a marathon to go. Twenty six point two miles to go. I checked my watch and realised I had nine hours before the course was closed. I could walk. I could probably even crawl it in that time. I just had to hold it together and I would finish. I started trying to run. The hip flexor that had been sore was complaining more loudly now. I couldn't do much more than walk. So I decided not to push it, at least for the first mile. Keep walking, keep moving. I'd run a bit when it was flat, walk up the slopes, jog the downhills and just try and not hurt myself any more. I was taking iced water at every stop, still trying to get the hydration back on track but I was still feeling tired after the bike. About a mile in I set my watch to beep every minute. Run a minute. Walk a minute. Run a minute. Walk a minute. I'd keep making this deal with myself, keep it going. Your mind starts playing strange tricks on days like this. I'd be running along (slowly) thinking 'okay, nothing hurts, I feel good, I don't feel tired, I can keep running this pace, keep it going'. Then I'd realise I was walking. No good reason, but I couldn't make myself run. Obviously my body is more sane than my mind. But over time, my mind won out. I'd run more, walk less. I kept drinking, filling my bottle with Gatorade which perked me up some more. I'd brought 10 Gu shots with me for food. I tried one and almost threw it up - that wasn't going to work! So I switched to plan G (I'd already used up plan B on the swim, plan C, D, E & F on the bike. Ironman is about dealing with things as they happen - so have lots of plans and stick to them. Any of them) and started scavenging on the course. Cookies were okay. Grapes, not so good. Jolly ranchers were fantastic! Anything and everything I could keep down with calories in them. Nine Gu packs bounced along on my back for the rest of the race, unwanted and ignored. I saw my brother at the end of the first loop on the run, 9 miles in to the marathon. He'd flown out from Scotland for work and decided to drop by to watch Amanda & I. He said later he didn't quite realise the scope of what I was trying to do, until he got there. It was great to see him and I picked it up and ran some more. You get a couple of race numbers, one with your first name and one with your surname. I'd decided to wear my first name and it was great. People would call out your name and lie to you at any opportunity. 'Looking good, Gordon' 'Looking strong, Gordon' 'Looking fast, Gordon' all lies, but certainly appreciated! I saw Amanda as she came back from her second loop. We stopped and hugged and then she was off - looking good, looking strong, looking fast. Some time on the second loop the chicken broth appeared at the water stops and I tried it. Chicken soup has never tasted as good! I'm not sure it goes too well with Gatorade, but I drank them along side for the next 13 miles. Somehow, someway I made it back to the transition area and headed out on my last lap. Looking at my watch I realised that if I ran this loop I could finish just under 14 hours. It was possible, but it would require some work. The previous two loops had taken me more than 1 hour and 50 minutes per loop, but I needed to do this one in about 1 hour and 40 minutes. Certainly possible with fresh legs. But now ? So I started running. Really running. Well, shuffling faster than I had been. It was starting to get dark by this point, the sun had set on the lonely Western stretch of my second loop. The field had thinned out as many people had finished, though some hardy souls were still just heading out on their second loop, heading for 16+ hour finishes or DNFs. Each time I passed someone, I pushed a bit faster trying to get to the line under 14. I focused on that idea and picked it up. I remembered an answer Peter Reid had given when asked about the deep, insightful thoughts he has during his Ironman-winning marathon runs. He said all he does is count his steps. So I counted my steps. 1... One foot after the other, 2... focusing on my cadence, 3... tapping out a rhythm with my feet, 4... running through the falling light. I was handed a glow stick to light me up and I wrapped it around my arm. I kept counting my steps. Running now, feeling finally good. One hundred and thirty miles after that swim start, I felt I'd finally warmed up and was flying. I was going to finish! I kept passing people. People who looked lost, walking almost aimlessly. Sitting on the kerb, head in hands. I passed people throwing up. I passed people walking. I kept counting my steps. I passed Jim Opre, that I'd trained with, and traded some lies with him 'Looking strong, Gordon', 'Looking good, Jim'. Finally another competitor caught me and passed me on the windiest stretch of the course. I fell in step behind him and drafted for all I was worth. We went back and forth like that for the final 4 miles. Close to the finish now, I saw a big hat that I recognised. Ralph Stanley was up ahead and we congratulated each other - only a mile to go. I was going to finish! I tried to pick it up a bit more and run through to the finish line. Just before the final hill I caught up with Jim Curry, about to start his final loop. He had a long way to go but plenty of time to get there. I ran up onto the bridge and across down to the finish line. One last time past the best support you could hope for, from Nancy & Karen. I could hear the announcer for the people finishing just in front of me, then suddenly I was out of the darkness and quiet and into the noise and light of the finish shoot. I high-fived some spectators and ran for the line. I could vaguely hear 'Gordon McGregor - You are an Ironman!' but somehow I can't remember much at all about finishing. Just a huge sense of relief! Chris Sellers was again at the finish and it was great to see a friendly face. He caught me and guided me through the finish, t-shirt, medal and bake-o-foil blanket on. I looked back over my shoulder and saw 13:53. I'd made it well under the 14 hours. My last loop was 1hr 42, 14 minutes faster than the previous loop. What sort of idiot negative splits the marathon in an Ironman ? Then I was out to see my brother and to congratulate all the other great T3 athletes that finished. 32 of us started. 32 of us finished. A huge achievement on a day when over 10% of those who started dropped out. 3000 people signed up for the race. Of those, 2461 were still registered by race week and issued with numbers. 2068 actually got into the water on the Sunday, to start. 2066 finished the swim. 1860 finished the whole race before the 17 hour cut-off. 13 of the 43 professionals in the race dropped out. I finished and everyone from T3 finished too. What a day! So here I am writing this, almost exactly a week later. This time, seven days ago, I'd be enjoying the beautiful blue lake and lights of the bridge in the gathering dark. The water that had been so murky and brown in the morning was a deep, tranquil blue, reflecting the twilight sky. It was a peaceful moment in the middle of such a hectic day. Made it all worthwhile. With the lights strung across the bridge and the desert sky above, I counted my steps and realised how lucky I was to be out there, doing this race, finding out what I can achieve when I just put my mind to it. Ironman isn't so much about the physical achievement, it's about the commitment. Committing to a goal that's bigger than you. Doing the training. Riding in the rain and thunder for six hours to Shiner, Texas. 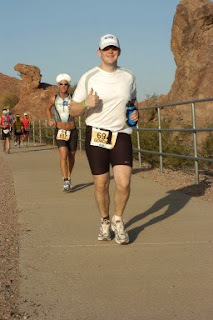 Running the 3M half marathon from the finish to the start line, then back again from start to finish. Freezing on a long, wet, cold ride out Fitzhugh Rd but finishing it strong. Swimming when the deck had ice forming on it. Getting out of bed on those cold, wet days. 3 hour rides on the trainer, watching Indiana Jones to stop us going insane. Lap after lap of Barton Springs. Running the damn dam loop on Town Lake one more time, then once more again. 100 mile rides out in Manor, getting chased by dogs and almost throwing up for messing up the nutrition. Finishing 20 mile runs that I wasn't even sure I could start. Turning up, day after day, month after month. Being consistent and being out there with Amanda. I'd never have finished without her and without all the other T3'ers that got us through. You can read Amanda's view of the race. So what's next ? 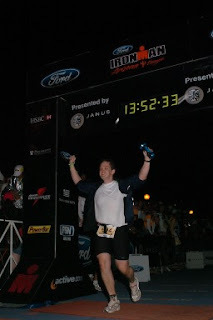 A half-ironman in St Croix in 2008, maybe Ironman New Zealand in 2009. Lots of options. The first one is the hardest! Now that I've finally finished the ironman training, I've actually started taking pictures again. We went out for happy hour with a lot of the others who we did the race with and I brought my camera along. 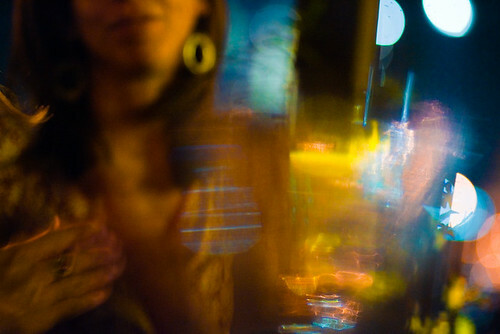 Sometimes the accidents and playing around can give the most interesting pictures. Here I was shooting from the table, manually focusing and not really paying a lot of attention - just getting back to being familiar with the camera and the controls after about a month off. Lots of flare, lots of noise, messed up white balance and some motion blur all just add to the character and feel of this shot of Laurie at Little Woodrows in Austin. I pushed and pulled the colours a bit, to strengthen the yellow/ blue relationships and add some more depth. I really enjoy the Lightroom edit on the image colour adjustment tools for working these sorts of images. It gives a much more direct feedback to point at the colours and drag to change them, rather than working with some sliders. Amanda & I both finished and finished well. I got in just under 14 hours and still felt good. All 32 people from T3 that we trained with finished, on a really tough, windy day when 10% of the people who started, dropped out. We did it! That's about the distance from Glasgow to Aberdeen. Somehow Amanda and I plan on doing that distance, under our own steam, next Sunday. We start off with a 2.4 mile swim - about the distance across the Clyde, from Cardross to Greenock, then we hop on our bikes and ride for 112 miles - from Glasgow, that would get you to Fort William. Then, after that brisk 7 hour warm up, we do a quick 26.2 mile marathon on foot to round out the race. In one day. Without getting any sleep. Us and 2,400 other people. But we are ready. 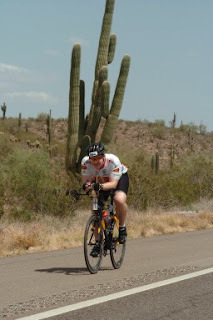 This all started about a year ago - I got an email from Amanda: Topic: ironman AZ Date: 05/02/2006 From: "McGregor Amanda-A14120" To: "Gordon McGregor" registration is up!!!!!! April 15th 2007... Let's do it!!!!!!! My first response was to tell her she was mad. So was my second and third responses. But after a couple of days, she wore me down (or actually, just signed me up anyway!) So we started on this crazy journey to finish one of the hardest races around. We joined a training group in Austin, called T3 and made a load of new friends. There will be 30 of us traveling out to Arizona to race together, which adds to the shared insanity. I took about 6 months just trying to get fit enough to start the training, dropped 25lbs and mentally got myself to a point where it didn't seem such a ridiculous goal. Then we started the training. 20+ mile long runs in the cold and wet. 6 hours freezing on a bike. Swimming in the dark and cold. Amanda kept better track than I did, but we've swam over 50 miles, rode over 2000 miles and ran 450 miles training since September. Oh, we are ready. So we fly out to Tempe on Wednesday evening to start the final stages of this long journey. This is the time to really enjoy : the race. The training was hard, the race is going to be hard, but nothing is going to stop us finishing. Someone will need to drag me off the course. Plenty can go wrong, but I'm not stopping. 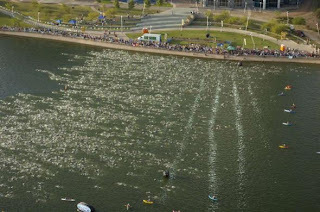 7am next Sunday morning, the canon fires and we take off in the mass swim start in Tempe town lake. 2000+ bodies swimming along side each other, punching, kicking, pushing and jostling for position. I can't wait. We are ready! The race starts at 7am. Swim should be a little over an hour, maybe 1:15, so we should be on our bikes some time around 8:30am, then spending 6 or more hours riding around Tempe. If things go well, we should be starting the run somewhere before 3pm, right when things will be getting hot! Then the marathon. My best time ever was over 5 hours, but that was a horrible experience! I'm hoping for a slightly better marathon this time around, but all things considered, I think we should be finishing close to 8pm around the 13 hour mark. We have 17 hours to finish, before they close the course and tell us to go home, so I think I have a good chance of getting there. I'm ready. Just to give some frame of reference for friends & family around the world, here's the times. I'm not claiming to be hitting any of these marks though! This is just a rough guide. My race number is 694. Amanda is 2114. 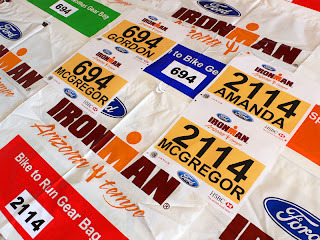 You can track us through the day at www.ironmanlive.com and see how we are doing. Though, if we don't appear, don't panic - it has been somewhat flaky in the past! 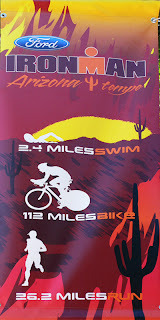 There's more race details at www.ironmanarizona.com. Wish us luck! For Amanda's view on all this, check her blog. p.s., Sorry for the lack of photo related blogging recently, maybe this explains in some small way, why.